Every woman wants to feel special and to be pampered, so we have created a series of events Ladies First that allows you to enjoy movies, which are the best for women. Enjoy the flood of positive emotions, become engaged in exciting activities and receive valuable prizes from the sponsors! Follow the monthly current events and be the first to get the tickets. Ladies first! Now ladies will enjoy special privileges also at the film theatre – on "Kino Citadele" will go on with its series of premieres, "Ladies First". 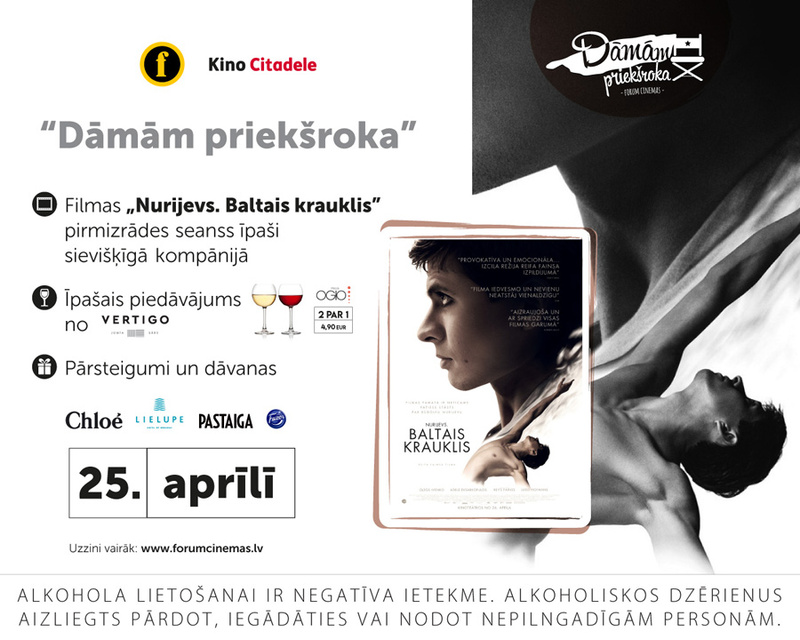 We invite ladies to watch the biographical drama "The White Crow" in especially feminine company on a special show at 18.30 on April 25, before the official release of the film on the Latvian screens. Before the show ladies will enjoy various surprises and presents from the supporters of the premiere – "Lielupe", "Chloé", "Pastaiga" and "Karl Fazer". Further on premieres of "Ladies First" will be held every month!